The sound of the Audi R8’s howling V10 engine is one of those things in life you simply cannot have too much of. In that respect the convertible version, dubbed R8 Spyder, offers a more evocative and dramatic experience than the hardtop. It faces stronger competition that ever from the recently updated Porsche 911 Turbo Cabriolet, unhinged Jaguar F-Type R and genetically similar Lamborghini Huracan Spyder. 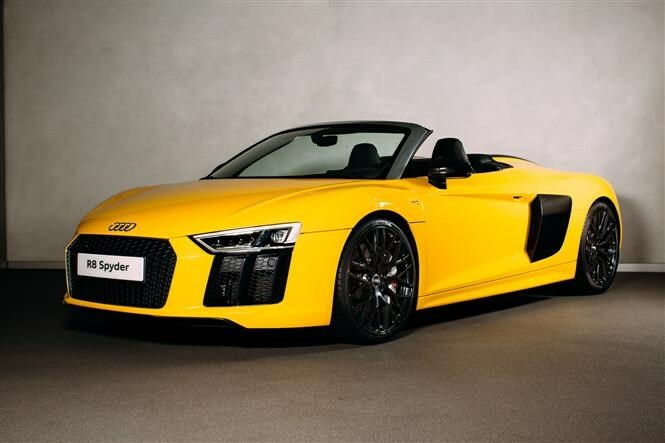 The ten-cylinder petrol engine in the R8 Spyder produces 533bhp and 540Nm powering it from 0-62mph in 3.6 seconds and on to a top speed of 197mph. As well as being more potent than the outgoing model it’s also lighter, with major components shedding up to ten percent of their weight. Despite this diet the car’s backbone, called Audi Space Frame, is 50 percent more rigid than before. All of these changes add up to what should be a faster, more agile car. Most importantly though the fabric soft-top opens and closes in 20 seconds, which can now be done on the move at speeds of up to 31mph. Power from the engine is channelled through a lightning-fast, seven-speed dual-clutch automatic transmission to the hallmark Quattro all-wheel drive system. This juggles power between the front and rear axles to help the R8 Spyder find grip in even the most challenging conditions. It can also be tailored by the Drive Select System, which offers four modes from comfort to Dynamic. Pick the optional performance steering wheel and you get three more programmes for dry, wet and snowy roads. Despite the huge power and all-wheel drive the R8 Spyder promises 24.1mpg and CO2 emissions of 277g/km for (relatively) low tax bills. Like the Coupe version the R8 Spyder features Audi's 12.3-inch Virtual Cockpit display featuring sat-nav, media and driving information, the rev counter and the speedometer. Also new is the smartphone interface, which allows functions from your phone to be displayed on the main screen, and headrest-mounted speakers for the Bang & Olufsen stereo. You get internet-based services from Audi Connect as standard, and MMI Navigation Plus, Audi Music Interface and seatbelt microphones to operate the voice control and phone while the roof is down too – just like in the TT Roadster. Pick the Audi Phone Box to connect your smartphone to the car’s aerial and wireless charger, plus there’s a host of exterior modifications too. You also have huge scope to tailor your R8 with popular options including carbonfibre for the front spoiler, diffuser and side blades. The standard LED headlights can be uprated with laser technology, increasing the amount of light and distance you can see in the dark. Orders open later in spring and the first cars will arrive in the UK customers in late 2016. Keep an eye out for the full Audi R8 Spyder review on Parkers.